You are here:Home-Domain.com-What is a Subdomain? You might think you have a firm grasp on what a subdomain is. After all, the name is rather obvious and a bit of a spoiler alert. But subdomains are filled with plenty of little intricacies that make them a unique member of the Internet ecosystem. And while you might feel confident about what a subdomain is, you might not be aware of everything you can use a subdomain for, or the challenges that come along with having a subdomain. For example, do you know the impact subdomains can have on your website’s search engine ranking? 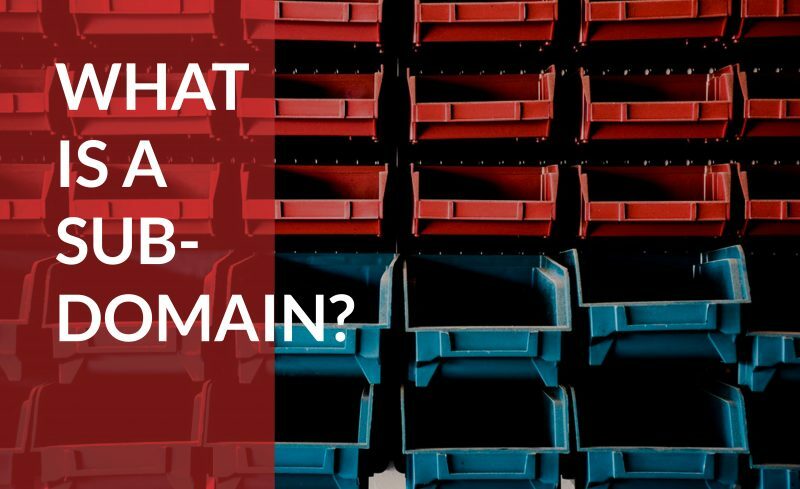 In this post, we’re going to dig into all things subdomains, so you can be much more confident about your subdomain knowledge than you were before. A subdomain is, as the name would suggest, an additional section of your main domain name. You create subdomains to help organize and navigate to different sections of your main website. Within your main domain, you can have as many subdomains as necessary to get to all of the different pages of your website. Here’s an example to give you a better visual. Let’s say you sell refrigerators at your main webpage, isellrefrigerators.com. If you sell your fancy food coolers online, you need to have an ecommerce store. This should be a part of your main website, which will then require a subdomain. The URL for your web store then becomes store.isellrefrigerators.com. Therefore, “store” is your subdomain, while “isellrefrigerators” is your main domain. The “.com” is your top level domain. You can actually use any text you’d like as your subdomain, but it’s in your best interest to make it something that’s easy for users to type and remember. You should be quite thankful for the existence of subdomains, whether you’re a web browser or the person building a website. The DNS, or Domain Name System, exists to make our lives easier. Because of the DNS, we only need to remember the names of a subdomain, rather than a random string of numbers. The Domain Name System (DNS) is in place to create an Internet hierarchy to regulate the domains and subdomains. These rules say that the domains always go right to left. Therefore the “.com” in store.isellrefrigerators.com is the top level domain, “Isellrefrigerators” is the second level domain, and “store” is the subdomain. There are people and companies out there that have created a lucrative business model by selling subdomains. To do this, they buy attractive domain names and sell the registrations to the subdomains. Other platforms, like WordPress or WebsiteBuilder, use a similar business model by allowing users to create their own profiles, on their own unique subdomains, underneath the same root domain. That’s why every WordPress site has both the unique name as well as the domain in the URL. While a subdomain is part of the main website, it’s considered a separate entity by search engines. People recognized this and decided to use subdomains to organize their website, without allowing certain parts of the site to be indexed by Google. Companies use subdomains for a variety of reasons. Mainly, it’s to give a webpage a separate identity in search engine results while also keeping it a part of the main website. One of the most common uses of subdomains is to use them as a testing ground for when you’re updating or creating a new version of your website. You can actually install a program like WordPress on your subdomain and use it as a completely separate entity from your main website. You can also test your updates and plugins on your subdomain to see how they perform before you publish them to your live site. When using subdomains as a testing ground, the subdomain will typically be something that web users won’t think to type in, since you don’t want them to see the content yet. They act as “hidden” pages where you can safely test new features before it is ready to go live. Let’s say you are making a pitch to a client to create their new website. You can create a subdomain that is specifically intended for them to give an idea of what their new website might look like. This is hosted on your own main domain, while retaining ownership of the subdomain. You can then customize the site to your client’s needs. Another example is if a restaurant group opens a new location. You can then add the new restaurant to the parent site, and create a web page for the new location. This keeps the new restaurant under your overall umbrella, while giving it its own online identity. There might be times when you need your web content to appeal to different types of users. For instance, if you have a lot of international visitors, you may need to translate your website into different languages. If so, you can create subdomains of your website so users can browse in their native language. It’s often easier (and more cost-effective) to create separate pages than to have one multilingual site. Sometimes, you may also need to cater your web content to different regions. The best example of this is Craigslist, which has separate subdomains for different regions. The websites are optimized for each specific region, but are all hosted on a master domain. It can sometimes be a good idea to break your blog off from your main site onto a subdomain. Maybe your blog following has grown and is slowing down your main site, or maybe because you want to switch up your blog design. You can also change your blog to a different CMS. But overall, you might want to move your blog because it serves a different purpose than your main domain. Depending on what your main domain does, it might make sense to move your blog to a subdomain so they can exist separately, while still being tied together under your main domain. Likewise, you may want to get your ecommerce page off of your main domain for the same sort of reasons. The goal of your main site may not be to make sales, and if you have a lot of traffic, or tons of products, it can slow down your pages, creating a poor user experience. Switching to a subdomain helps things move more smoothly and make your ecommerce site more accessible to your customers. A subdomain can also be utilized to provide a more mobile-friendly experience for your site visitors. Search engines like Google can recognize the type of device a searcher is using, and will serve the version of your website that gives them the best user experience. You can create separate versions of your website that cater to mobile, and even more specifically, to each screen size. This adaptive approach gives users a unique experience, catered specifically to the type of device they’re currently using. Each of these different layouts have their own specific subdomain. Providing a mobile-friendly subdomain is a must in today’s world, where more users are conducting searches on smartphones than on other devices. Subdirectories are another similar form of subfolders that can be used as extensions of your main root domain. While a subdomain typically comes before the main domain in your URL, a subdirectory would come after. Using our earlier example, isellrefrigerators.com, if you were to add the store as a subdirectory instead of a subdomain, it would appear as isellrefrigerators.com/store. There is much debate over whether subdomains or subdirectories are better when it comes to organizing your website and your many subfolders, especially in regards to search engine optimization. Let’s quickly look at some of the pros and cons of each. Because subdomains are regarded as separate websites by Google, they also need to be hosted on separate hosting plans. This means that you will need to pay a separate hosting fee for each subdomain. Hopefully, you have a web registrar that offers discounts for multiple hosting accounts, otherwise, this can grow to be quite costly. Meanwhile, you only have to pay one hosting fee when you use subdirectories. The amount of your hosting fee will depend on the overall size of your website, as well as how much speed is required for loading content. With a subdomain, you can customize your website content to cater to different regions, users, and products. If you need unique content for each of your different subdomains, this can be a valuable feature. It also helps to optimize each subdomain for local search results. However, if you don’t really need to create such highly-customized content, you may be better off using a subdirectory. This may be much easier to manage, and doesn’t include the extra hosting fees. Whether a subdomain or subdirectory is a better choice here depends on your specific website needs. It used to be thought that subdomains and subdirectories were equals when it came to their impact on SEO. In fact, in 2012 Google spokesperson, Matt Cutts, said there were “roughly equivalent,” adding that Google saw them as one domain. However, this thinking appears to be shifting. Search engines now keep different metrics for domains than they do for subdomains. For that reason, it is better for the webmaster to place their link-worthy content (ex: blogs) in subdirectories rather than in subdomains. Therefore, isellrefrigerators.com/blog would be a better option than blog.isellrefrigerators.com. An exception for this is when you require language-specific websites, in which cases using subdomains is still the better option. Subdomains were previously preferred by webmasters because they were able to stuff subdomains with the keywords that they wanted to target in rankings. The goal was to load the search engine results pages (SERPs) with the given keyword using their main domain and subdomain pages. However, Google caught onto this loophole and began to crack down on the practice. Now, when they make the connection, Google consolidates the search results and displays just one domain to the given search result. Stuffing subdomains with keywords to attempt this strategy can now lead to penalization by Google. Whether you choose to use a subdomain or subdirectory comes down to what your website needs to accomplish. Overall, search engine rankings are determined by quality content more than anything. A subdomain can be an effective tool to help you organize your website more efficiently, and when used correctly, will not negatively impact your website’s SEO. However, subdomains may be best used when you want the content to be private and not for your public sites.